In the last blogpost I introduced some of the new features of Zotero that help you to collect and organize your references more easily. Zotero 4.0 also has a number of new features that improve citations and make syincing more flexible. Up to now, Zotero took journal abbreviations from the “Journal Abbr.” field. Many databases don’t populate that field properly or at all, so this required a lot of maintenance by users who needed correctly abbreviated journal titles in citations. Now, Zotero comes with a built-in journal abbreviation list. The list takes the journal title from the “Publication” field and matches it against a list of journal titles and words to create a journal abbreviation. The abbreviation list currently only works when using the word processor plugins. For new documents, the option to “Automatically Abbreviated Journal Titles” is active when using styles requiring abbreviated journal titles. In documents created before the release of Zotero 4.0, you can turn on the option under “Set Document Preferences” in the word processor plugin. It will only be available if your chosen citation style requires abbreviated journal titles. When you sync Zotero to a new computer with file syncing enabled, all item data and all attachments are downloaded. As attachments can take up multiple gigabytes, this can be a long process, impracticable for users who switch computers often. In Zotero 4.0, users can set file syncing to “Download files as needed.” That way, files on the server will only be downloaded when you try to open them. This option is turned off by default. By default, Zotero stores all file attachments in a “storage” folder in the data directory. 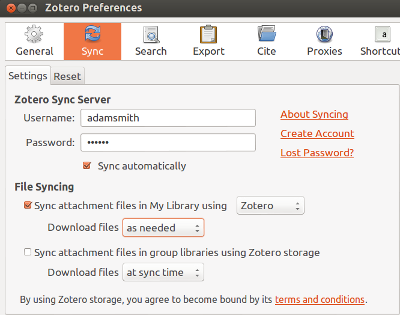 Using file sync via Zotero file storage or a WebDAV server, you can sync these files and comfortably access them on multiple computers. Some users, however, prefer to use their own organizing structure for files in their file system and link to them from Zotero. In the past, this made accessing files on multiple computers difficult. On one computer a file may have had the path ‘/home/workcomputer/Zoterofiles/Important-Paper.pdf’ while on another it was ‘/home/homecomputer/Zoterofiles/Important-Paper.pdf’. The link to this file – what we call an “absolute” link – would only work on one of the two computers. In Zotero 4.0, you can now specify a base directory, and have linked files be relative to that directory. In our example, you would go to “Files and Folders” tab of the “Advanced” tab of the Zotero preferences and on one computer input ‘/home/workcomputer/Zoterofiles’, on the other computer ‘/home/homecomputer/Zoterofiles/’ as the “base directory.” The link to ‘Important-Paper.pdf’ would then work on both computers. This will also work if there is a folder structure within the base directory, as long as it is the same on both computers. This is still not everything. 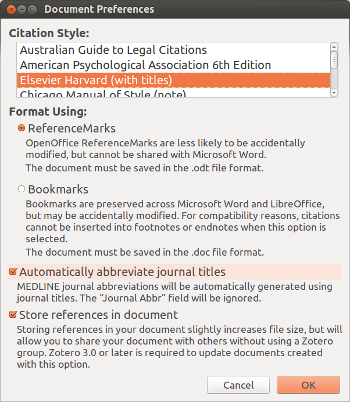 Even more new features were introduced in Zotero 4.0. They include multiple performance improvements — for syncing, duplicate detection, pdf metadata retrieval — as well as many little additions that we hope will make Zotero even more useful to you. You can find a full list of all changes here. As always, if you have any questions about Zotero, a dedicated group of users and developers are happy to help you on the Zotero Forums. This entry was posted in Documentation and tagged 4.0, Documentation, Zotero on April 11, 2013 by adam3smith. This is an extended write-up that I originally prepared for the Zotero blog, but that turned out too extensive for that purpose. At first glance, the changes in Zotero 4.0 may seem small. It may even have taken you some time to notice that Zotero had updated to a new major version. In reality, though, Zotero 4.0 introduces a wealth of new features — so many, in fact, that it will take us two blogposts to introduce them. In this post I will cover the features that are broadly related to organization and import. The second post will cover features related to syncing, file management, and citations. Not all tags are created equal. Maybe you have a “to read” tag and you would like to quickly identify items on your reading list. Or you have your favorite articles marked as important. 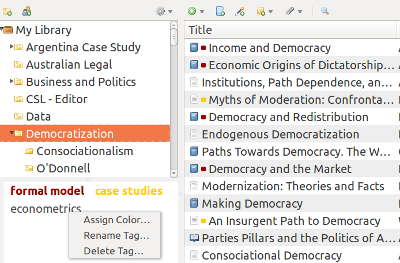 For those and many other cases, Zotero now allows you to assign colors to up to six tags. You can assign a color to a tag by right-clicking on it in the tag selector in the left hand panel. The item will then appear with a colored square before its title in the middle panel. Obviously one item can have multiple color coded tags. Color coded tags can also be assigned particularly quickly. When you assign a color, you also assign a number to a tag. You can then automatically tag any item(s) selected in the middle panel just by pressing that number on your keyboard. While typically you would copy and paste such a list, e.g. from a text editor or even a spreadsheet, you can also toggle the add tag/add identifier field into multiline mode using Shift+Return. You can now add separate columns for Notes and Attachments to the middle panel. The “Notes” column contains the number of child notes (if any) attached to an item. The attachment column – marked by a paper clip – marks items with at least one attachment with a dot. The dot will be colored blue if the attachment is present on the currently used computer and hollow if it is not (e.g. if file syncing is turned off or if files are only synced as needed – a feature that we will introduce in the next blogpost). By the way – we have also added many more options for columns to add to the middle panel. When you import items using the URL bar icon, Zotero now tells you in which collection it is saving and lists all attachments it downloads for an item. That way you will see immediately if an item is saved into the right collection and if e.g. a PDF of an article was successfully downloaded. We released the bookmarklet for Zotero several months ago, but in case you missed it: With the bookmarklet you can now take advantage of Zotero’s convenient one-click import from hundreds of sites from mobile devices (saving straight to your zotero.org account) or previously unsupported browsers such as Internet Explorer (saving either to Zotero Standalone or to zotero.org). You can download the bookmarklet and find additional instruction here.